Santus Circus - Le Cirque de France - is coming to Putney! The Big Top will go up at Lower Common, Lower Richmond Road to bring thrills and skills, gasps and laughs from 11th to 15th September. And you have a chance to see this fun-filled and thrilling traditional-style Big Top show for FREE! SANTUS CIRCUS is an all-human show featuring flying trapeze, high wire, knife-throwing, juggling, aerial silks, an appearance by Spiderman, comedy trampoline, a mystifying quick-change act, and gentle, friendly clowning. They’re the eighth generation of their family to excel in the circus arts. 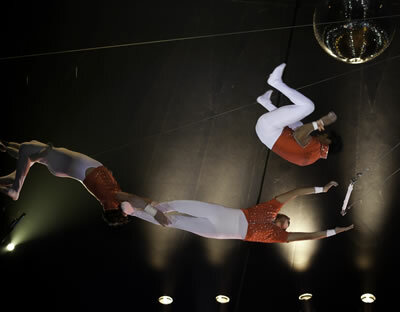 Each year, a new all-human production of their circus takes the road to entertain the people of south-eastern England. With their own families, the Santus brothers are proud to present their traditional-style show in Britain - it’s become a firm favourite with audiences across London, Essex, and Kent. Ernest and Roger Santus are members of some of France’s most illustrious circus families. Taking on almost every sort of skill and presentation, from hand-balancing and trapeze to unicycling, juggling, and acrobatics, they’ve performed across Europe and in Asia, and they’ve won top prizes at the prestigious Monte Carlo Circus Festival. Titled TRAPEZE, the 2013 production includes top-quality international artistes from Colombia, Romania, the Czech Republic, and of course Britain and France. Performances run around two hours, and feature flying trapeze, high wire, knife-throwing, juggling, a mystifying quick-change act, and gentle friendly clowning. Santus Circus performs under a colourful heated Big Top. Prices start from £9 (but look out for Discount Vouchers to get money off!) A Family Ticket for two adults and two children costs just £40. And – even better value – all tickets on Wednesday 11th September are only £7!